I don't necessarily consider myself one of those strictly natural kind of gals. I do, however, take the time to read the list of ingredients on items I put in my grocery cart. What is "acetylated tartaric acid esters of mono and diglycerides" anyways? And I've heard on more than one occasion: "you don't even want to know what a 'modified milk ingredient' is". It's a little scary once you start really looking at what's in your food. Especially since there was once a day that we made our food from scratch, we bought what was in season, and we were just fine without preservatives and prolonged 'freshness'. Of course, I believe science and technology have allowed humankind to make great advances. Food included. I guess I'm just not fully convinced that my food has to have a list of ingredients as long as my arm and full of words I can't pronounce to be healthy or delicious. I also believe that there's something to be said about a fresh loaf of bread. Being at home with Grace has afforded me the opportunity to do things that I may not have done while working full-time. Baking bread is one of those things. I tried my hand at a few different recipes and wasn't exactly impressed with the mediocre, bland-tasting loafs they produced. Then, I found a stellar concoction that I tweaked (of course, I do nothing 'by the book') and making bread weekly fast became a delicious habit. Some people I talk to couldn't fathom baking their own bread either due to the time it takes, working with yeast, or not getting the results they want. This recipe, however, will make you want to change your tune. Stir the first four ingredients together in a warm mixing bowl. Let sit for 5 minutes allowing yeast to activate. Then add all remaining ingredients except the 5-6 cups of flour. Mix for 2 minutes in your mixer fitted with the dough hook. (You can, of course, do this by hand, but having the mixer cuts your physical investment in this bread down to a super-crazy-minimum). Gradually add the flour until dough pulls away from the sides of the bowl; dough will be a bit sticky. Place dough in oiled bowl and let rise in a warm place free of drafts. 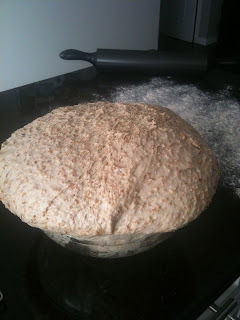 I often let is rise uncovered in the oven with a bowl of boiled water. Let rise until double in size, or about one hour. 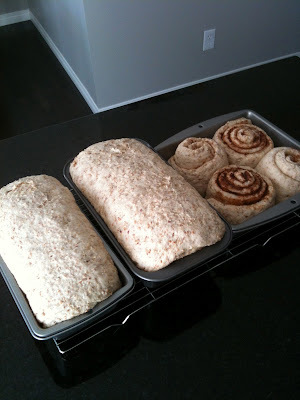 Divide dough into 3 pieces and roll out to form into loaves. Place in greased pan and let rise again. This recipe makes 3 loaves but as my husband loves little else more than cinnamon buns, I devote some of the dough to those (as pictured). A cinnamon loaf just so happens to be perfect for Sunday morning brunch; cinnamon 'bun' french toast anyone?